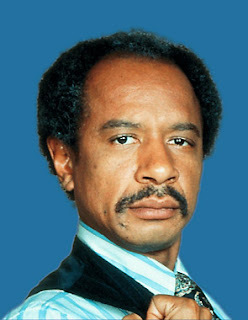 Sherman Hemsley, famous actor and star of the hit TV series The Jeffersons, passed away yesterday in his home in El Paso, Texas. Although he is no longer with us, it's nice to know he's movin on up. “It was 1978 or 1979, and Sherman Hemsley kept ringing me up. I didn’t know him from a bar of soap because we didn’t have television in Spain (where I was living). He called me from Hollywood saying, ‘I’m one of your biggest fans and I’m going to fly you here and put flying teapots all up and down the Sunset Strip..."
"...Inside the front door of Sherman’s house was a sign saying, ‘Don’t answer the door because it might be the man.’ There were two Puerto Ricans that had a LSD laboratory in his basement, so they were really paranoid. They also had little crack/freebase depots on every floor. Then Sherman says, ‘Come on upstairs and I’ll show you the Flying Teapot room.’ Sherman was very sweet but was surrounded by these really crazy people." RIP to a genuinely awesome dude.